Affordable, healthy food and safe & accessible areas for physical activity are scarce in many places. That’s why MO Project is building a movement and we want to hear from the youth! The typical workshops consist of four sessions, but can be tailored to meet the needs of your community. The sessions include: Advocacy, Spoken Word, Film making and Youth Engagement. 1. Advocacy Session –This interactive session focuses on how young people can make environmental change in their local communities and neighborhood. Through simulation and debate style activities, this session brings out the “real issues” that makes a community unhealthy and how they can change that. 2. Spoken Word Session- This highly interactive session involves activities that inspire youth to brings out their own opinions and voice about how health disparities are greatly affected by the environment in which they live. 3. Video Session- Participants receive hands-on peer-to-peer training on basic video making and editing. If time allows, groups of youth will make videos that will be screened at the end of the training film festival style. 4.Optional: Parent ‘Youth Engagement’ Session- Designed specifically for adults, this session focuses on the importance of adult involvement and support with youth advocacy activities to ensure successful youth projects and in forming successful youth/adult partnerships. · Various youth-led activities and presentations based on preparation time with each community. · Community mapping to understand the strengths and challenges of the neighborhood. “MO Project is a fun and easy way to use videos to show what you want to change in your community and let your voice be heard,” – Julia, age 15 from Bakersfield, CA. Youth ages 13 - 18. MO Project gets youth engaged in community efforts to build healthier communities. The workshop provides peer support; networking opportunities; and skill-building in nutrition, physical activity, built environments, communication, messaging and advocacy. Although there are numerous barriers to engaging youth in advocacy, MO Project can meet youth where they are, encourage and inspire them to be change agents in their community. MO Project has successfully engaged over 500 youth in communities across California including Merced, Chula Vista, Kettleman City, Santa Ana, Richmond, Arvin, Ceres and Long Beach. View past convenings. With funding from the California Endowment and Kaiser Permanente (Southern CA), MO Project started as a statewide online media contest for youth ages 13 - 18 to make a video, poster or spoken word about what they wanted MOre of to improve health in their community. Youth from all over the state made videos showing the everyday challenges affecting their health. The winning entries included videos about improving school lunch, creating safer sidewalks, starting a positive graffiti wall and building a skate park. Get contest details and view videos. 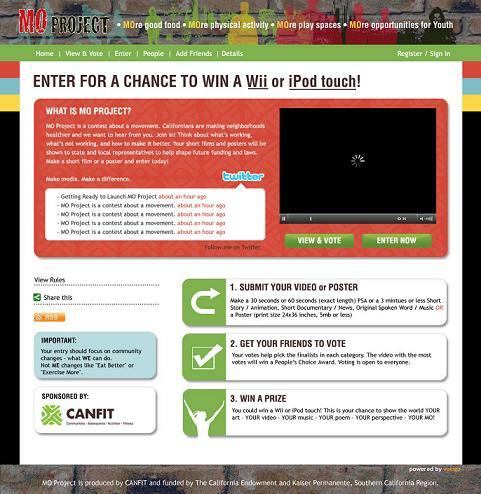 View the MO Project contest site. MO PROJECT youth videos are shown to state and local representatives to help shape future funding and laws. Check out how youth are making a difference in the following articles featuring MO Project. - Richmond Youth Take Health in Their Own Hands from Youth Outlook Magazine.